Click on one of the locations around Chatham or Pitt Islands in the map below and you will get the tide tables for that location for the current year. If you get a message that the tide table is not available, you need to email Derek Goring and ask him to produce it for you. 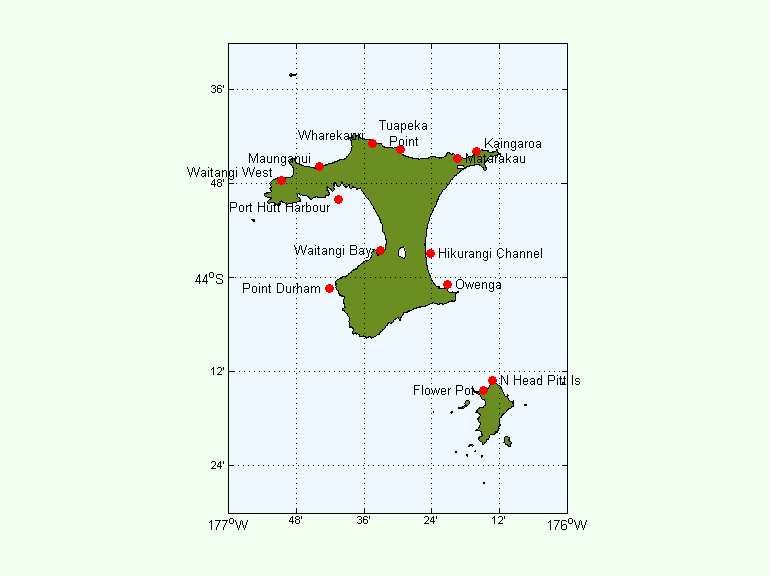 The times are in Chatham Islands Standard Time which is 45 minutes ahead of NZST and 12.75 hours ahead of GMT. The tide heights are relative to mean sea level, so high tides are positive and low tides are negative. Actual sea-level heights may be up to 0.75 m higher or lower than these heights as a result of storm surge and other factors. Each set of tide tables is in a .pdf file that you can save and print, but you will need	Adobe Acrobat Reader, which can be obtained (free) from here: If you want to download the .pdf file, rather than open it, right click and hit "Save Target As..."	or "Save Link as..."
You can find out the tides at any of the stations in the map anytime (past, present or future) by going to: Daily Tides. This service is running on a tiny computer called a Raspberry Pi. There are some details about it here.